Over Christmas break, it was time to automate collecting and displaying the incredibly detailed imagery from the GOES-16 Advanced Baseline Imager. A problem that plagued previous efforts was not accessing the raw data, a netCDF formatted file for the contiguous U.S. which can be downloaded freely from a variety of cloud data hosts. With the raw data, one can project, modify and use it in web mapping libraries like Leaflet. This page offers a slippy map of grayscale and color imagery and is updated every 15 minutes. You can download GeoTIFFs of rendered layers that can be used in GIS applications. During the Fall 2018 semester, students mapped and visited arches and waterfalls in Kentucky’s Red River Gorge Geological Area. They adopted an arch or waterfall and produced maps, analyses, 3D visualizations, and a web page that explores their arch. Visit the site. This summer we are planning an update to our popular Red River Gorge trail map. Since the release of the Lidar point cloud data for Daniel Boone National Forest, we have been excited to start the project. 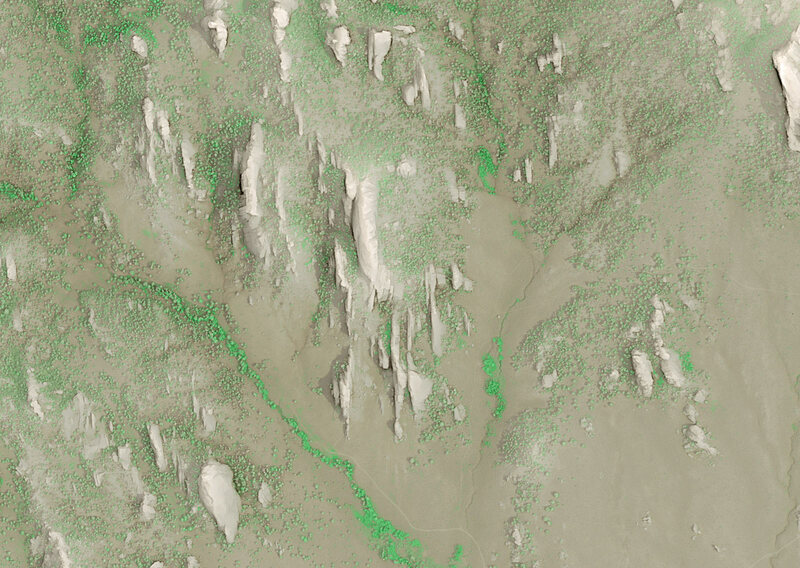 With a pixel resolution of 5-foot, this is the most detailed elevation layer we have for the Red River Gorge. Let’s take a look at some samples. An elevation profile of the well-known landmark, Natural Bridge arch, shows canopy slightly dimmed and you can clearly see the arch. Many other interesting analyses are planned; for example, where are the high cliffs and overlooks? In the right image, we show the cliffs over 100-feet in height. We can clearly see the high cliffs of Pinch ‘Em Tight, Chimney Top, and the other high cliffs the line the Red River. Of course, the inclination is to find the highest cliff in the Red River Geological Area. With a preliminary analysis, we have found the Small Wall climbing area has one of the highest cliffs at 220-feet. Students create many maps and a website for the soon-to-be-built Town Branch Trail during the Spring 2017 semester in the GEO 409 (Advanced Topics in GIS) in the Department of Geography, University of Kentucky. We used mainly open source GIS software QGIS and GitHub to create and publish our maps. We used mainly open source GIS software QGIS and GitHub to create and publish our maps. For the final project, students grouped into separate teams for web page production, field GPS and photography, story production, and 3D mapping. We’ve updated our map of the Sheltowee Trace on our ST site: sheltoweetrace.com/hike. The map has symbols for official recreation sites and trails for the Daniel Boone National Forest, Big South Fork National River and Recreation Area, and Cumberland Falls and Natural Bridge State Resort Parks. Of course, it has the ST and mile markers from the northern terminus. Since we deployed this map last year, we have updated the Leaflet and MapBox JS to make the work with a GPS-enabled device as long as you have a cellular data connection. The points of interests and trails are clickable with useful travel information. Our next goal is to fill out the map with more scenic destinations and include more photographs. Let us know if you have any suggestions. A map historically significant homes and structures in the Martin Luther King and William Wells Brown neighborhood associations; many have connections to African-American work and life over the past two centuries. It was a pleasant afternoon walking Onabits, aka lil’ blue eyes, and taking photographs in my neighborhood. With the growth of the north Limestone corridor and the planned development of the Midland and 3rd street area, it’s important to recognize the history that resonates through downtown Lexington. We’ll come back in 10 years and see how many of these structures remain. 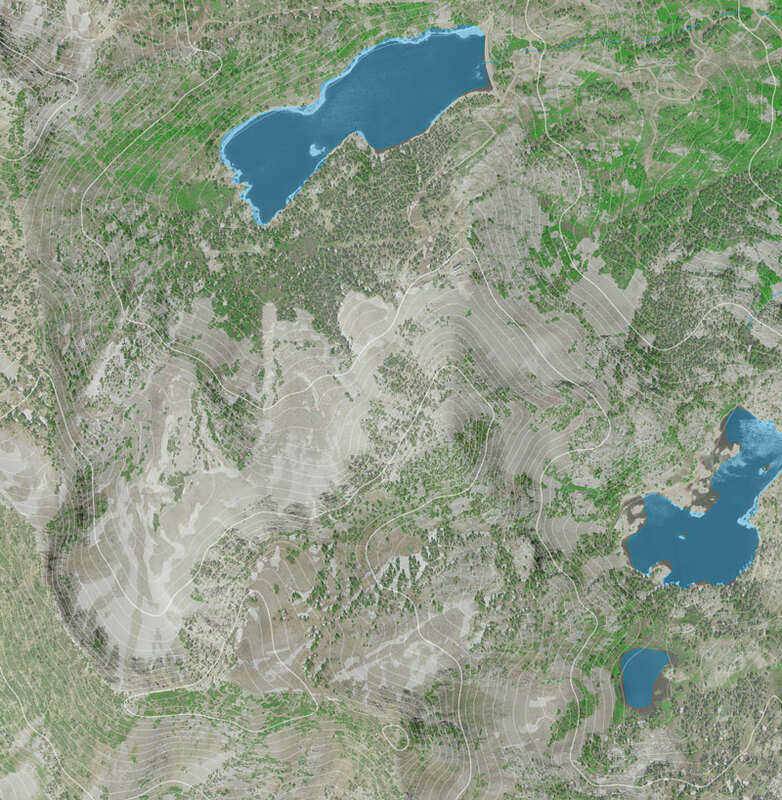 A client needed a base map for an upcoming hiking guide to areas east of Salt Lake City. We came up with a simple, clean photoshop file using NAIP aerial imagery and 1/3 arc-second seamless DEM. The NAIP was used to create an NDVI and estimated canopy cover and the DEM was used as a shaded relief and to generate 40 ft contours. The NDVI and shaded relief were used for emphasis and helped make the aerial ‘pop’ a little more. Lakes and perennial streams were added, but as you can see the don’t register perfectly with the aerial image. Over the past year, we’ve refined a trail map for the City of Norris, Tennessee. 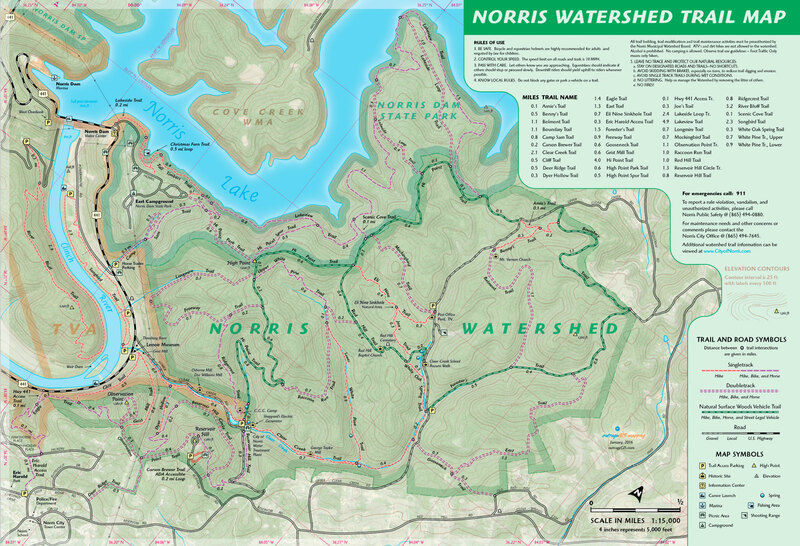 The Norris Watershed Trail Map is probably printed by now and offers GPS mapped trails and mountain biking opportunities. The WPA era dam is pretty cool, too. Explore the Swift Camp Creek Trail in the Red River Gorge with this 3D map. Learn more about this trail in our hiking trail page. As part of UK Natural Resources and Environmental Sciences 2015 Summer Camp, I taught a one-day GPS and GIS exercise to map the interpretive trails around base camp. With seven undergraduates and their mobile devices and one Trimble ProXRS, we split into three teams. One team focused on the trail network and GPS mapped trail alignment and intersections. A second team mapped interpretive sites on the left-side of trials, while a third-team mapped right-side features. In the second-half of the day, we worked in the classroom and on laptops to make a map in ArcGIS. Some students had GIS software experience and helped their fellow classmates to make a map as a geospatial PDF and use on their mobile devices. A GeoPDF is a mobile map that doesn’t require a cellular data connection to function.